A limited number of vintage Tootal scarves are now being offered for sale here at Modculture. The scarves are all in excellent condition and are probably the last we will have for sale for some time – so don’t delay in picking one up! 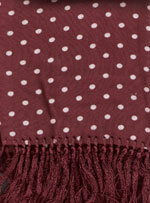 First class postage on all scarves for the UK is £1, overseas – please contact us. Payment can be made ideally by Paypal, but we will also accept cheque or postal order from within the UK.